These 10 tips will help you make the best yeast starter possible. Contaminating microorganisms in the pitch is one of the main causes of contaminated beer. (No, it’s not “infected.”) Be extra diligent with your cleaning and sanitation when making a yeast starter. If it gets contaminated, your beer will be very contaminated. Clean the starter flask or jug, then hold it up to a light to visually inspect it. If you see any spots, no matter how small, re-clean the vessel. Sanitize everything well. (And remember, given the size of glass jugs and flasks, boiling is option.) Work swiftly when transferring the yeast to the starter vessel. The point of a yeast starter is to grow yeast in an environment as stress-free as possible, and high-gravity worts are stressful to yeast. As such, make the specific gravity of your starter OG 1.040 (10 °Plato ) or under. I like making starters around SG 1.020 because they ferment in one day (or less), then I let them sediment the next. Yeast grow best at temperatures above which good beer is made. Unless you plan to pitch your entire yeast starter, raise your yeast above normal ale fermentation temperatures. Holding your yeast starter around 80–85 °F (27–29 °C) will work well. Not only will the yeast grow healthily, your starter will ferment quickly. Yeast require oxygen to build healthy cell walls. However, you shouldn’t aerate a fermenting batch of beer for fear of ending up with excess diacetyl. So, all your aeration needs to be done prior to pitching the yeast to the main batch of beer. 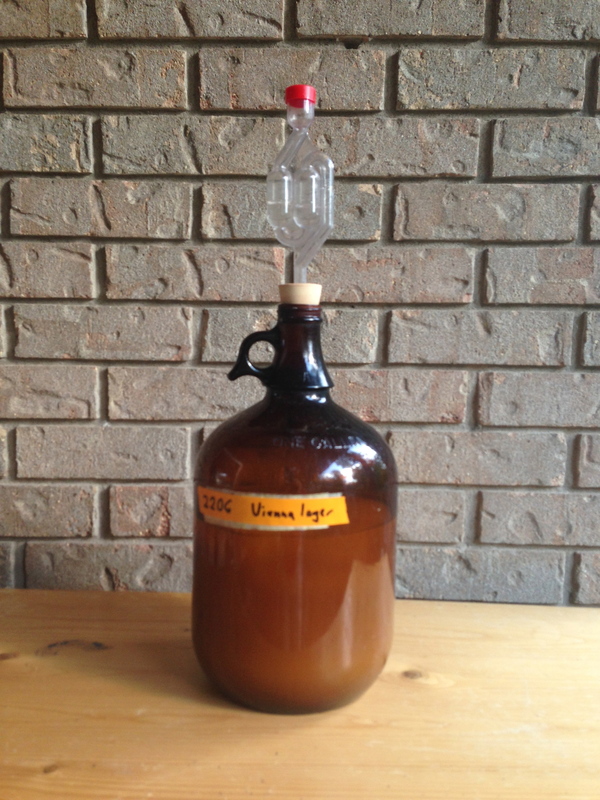 Aerating your starter while it is fermenting helps with your overall goal to aerate the main batch. Aerate the starter wort well before pitching your yeast. However, don’t be afraid to aerated an actively fermenting starter. A simple shake every now and again will help, and some folks even continually feed their starters with a slow, steady stream of air. If you plan to aerate intermittently with an air stone, be extra diligent with your cleaning and sanitation (and watch for sudden, gushing foaming). Also, if you aerate the starter while it’s fermenting, pitch only the yeast sediment, not the entire starter. Swirling your starter intermittently, or stirring it constantly on a stir plate, will keep the yeast in suspension longer and yield higher cell counts. If you simply pick the starter up and swirl it every once in awhile, be aware that it may foam up quickly. Go easy so you don’t end up blowing kräusen through the airlock. Fresh commercial liquid yeast is very healthy coming straight out of the smack pack or tube. All the required nutrients and micronutrients have been supplied to it. Plus, a fast fermentation in a well-aerated, warm, weak wort is not going to be particularly stressful to the yeast. So, there is no need to add excessive amounts of yeast nutrients to a yeast starter. When yeast are healthy, they are not going to take in “extra” nutrients. As such, excess nutrients in the starter wort could end up feeding contaminants more than the yeast. If you think the batch of beer is going to require yeast nutrients — for example, in a beer with a large amount of sugar added in the kettle — add the nutrients to your main wort, not your yeast starter. For starters one gallon (~4 L) in volume or less, pitched from a fresh commercial yeast pack, I don’t add yeast nutrients. For bigger starters, I may add just a pinch. Fresh, commercially-supplied yeast is healthy out of it’s package and a well-run starter fermentation should not be stressful. However, once your starter has fermented, you should use it promptly. Preferably the day the yeast has sedimented or the next. If something comes up and your brewday is going to be postponed for a few days, refrigerate the starter. If you store the yeast for a week or more, you should revive the yeast with some fresh, well-aerated starter wort (and perhaps a pinch of yeast nutrients). Sometimes, you will need to step up a yeast starter to a larger volume. 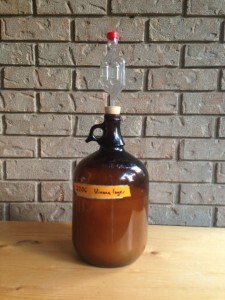 For example, if you are attempting to harvest and propagate yeast from a bottle-conditioned batch of beer, you would start be pouring out the beer, exposing the yeast sediment in the bottle. Then, you would pour a tiny amount of fresh wort in the bottle — just enough to cover the yeast sediment. Later, when the the yeast has had time to wake up and ferment the fresh wort, you would use that wort to pitch to a larger starter to propagate your yeast. As a rule of thumb, you should never propagate the yeast to a vessel over ten times larger than your current one. For example, if you poured 5 mL of fresh wort in the bottle-conditioned beer, your next step would be to a 50 mL, the next 500 mL and so on. The 10X rule keeps the volume of the propagating vessel small enough that the yeast can colonize it quickly, limiting the opportunity of contaminating microorganisms to get a foothold. Working backwards, this would suggest that at least a 2.0-qt. (1.9-L) yeast starter would be appropriate for a 5.0 gallon (19-L) batch of beer. And this is actually a great rule of thumb for most moderate-strength ales. Occasionally, you will see homebrew recipes calling for smaller yeast starters. Sometimes, this is to limit the number of cells pitched in order to yield certain fermentation characteristics from the yeast. In these cases, it’s OK to break this “rule,” just be sure to pay attention to your cleaning and sanitation. Yeast cells are almost transparent. Light, for the most part, passes right through them. (This is why they need to be stained when viewed under a microscope.) As such, they are vulnerable to DNA damage from light. A yeast culture exposed to lots of direct light — especially direct sunlight — is going to end up with mutants in the population. Mutant yeast cells may simply be poor performers, or they may produce fermentation by-products you don’t want in your beer. You don’t need to worry about small amounts of light exposure — but just to be safe — it’s best to ferment your starter in a dark jug, or if you use a transparent flask or other vessel, tape papers over it or wrap it with aluminum foil. Finally, assess the quality of your yeast starter before pitching it. You should smell the starter and taste some of the decanted starter beer. Identifying off aromas or flavors can be challenging at first, because sometimes a healthy starter will have off-putting smells of flavors. For example, some lager yeasts will yield starter beer that smells very sulfurous. Some Belgian strains will give off very sharp, phenolic odors, especially at high temperatures. If you aerated the batch while it fermented, your starter wort will likely small and taste strongly of diacetyl. The more closely your yeast starter resembled a batch of beer — especially in terms of when you aerated it and the temperature you fermented at — the more your starter beer should smell and taste like beer. However, with practice, you should be able to pick out potential problems in your yeast starter. If you think that your starter is contaminated, having some dried yeast on hand as a backup is good practice. Finally, a yeast starter article with some detail. Awesome article. It directly addressed some persistant nagging insecurities I had with my process. Thanks!! Chris, in a more recent article you say to put the yeast nutrient in the starter. This article speaks of the futility of putting yeast nutrient in the starter. Have you changed your mind, and why? Good question. In this article, I say to use yeast nutrients sparingly. In the newer article, I say to add a pinch of yeast nutrients, up to around the recommended amount of slightly more. This is a case where using numbers instead of verbal descriptions would help. I would say that there’s no case in which adding a lot of yeast nutrients to a yeast starter is a good thing. They can only use so much, and — if you pitch a fresh commercial package — they should be in good shape. A little bit, up to around the manufacturers recommended level for yeast starters, is fine. (This will be expressed as number and will be fairly low.) But more isn’t better. If you are reusing yeast, stepping up yeast, or for some reason making a higher-gravity starter, adding slightly higher doses of yeast nutrient may make sense (within reason). But for low-gravity starters pitched with fresh, commercially-prepared yeast, keep the yeast nutrient addition low — in the range of the manufacturer’s recommended dosage for yeast starters. So is it wise to do a yeast starter and aerate the wart before pitching starter or is doing both over kill ad to much O2.